Discussion in 'Predators and Pests' started by DuckFanatic, Aug 7, 2009. I lifted up the duck pool to dump it, looking to see if there was and big bugs to throw to the chickens. I didn't see anything until I turned and fast movement caught my eye. I turned around to see what I thought was a big worm and was in a state of chock when I realized this was no worm at all.. but a SNAKE!! So as quickly as I could, I got the feisty little guy contained and took some quick pics. If the pics don't show it well, it is green with a yellow stripe along it's back and black spots. It is pretty small, but feisty! Before I let it go (far away), i'd like to know what it is. I am thinking it is poisonous because of it's bright colors? Thanks. Looks like a garter snake to me. Highly NON-venomous. Great eater of grasshoppers and frogs. Yep, its a garter snake. Lovely little fella's. I am still scared of him, but they are great to have around. I've read that they will even eat the venonmous snakes. 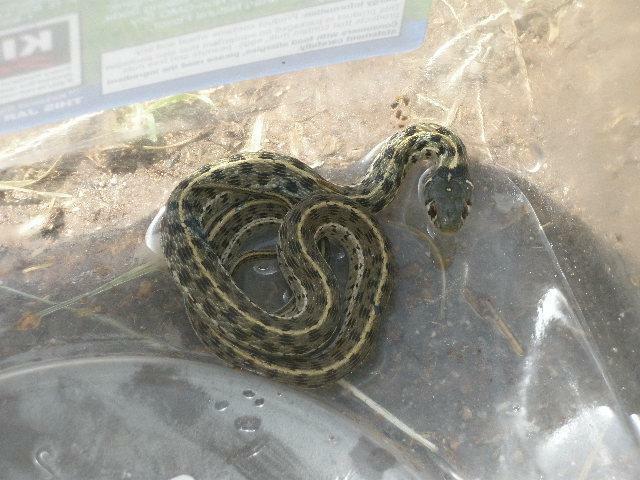 idk wat it is dosnt look like the garter snakes here in PA mine are black with one yellow stripe. I would just be careful anyways. I'm with Joe.....don't look like any garter snakes we have either. PLUS, the head is much larger than the body and diamond shaped. I cant say for certain what it is, but, I'd be very careful with it....and I ain't afraid of snakes!!! I'm no herpetologist, but the shape of the head and body is an awful lot like our rattlesnakes. No rattles though. Please don't try and relocate a snake unless you're certain of the species, we'd hate for you to get bitten! It's weird how the head is shaped like a venomous snake's.